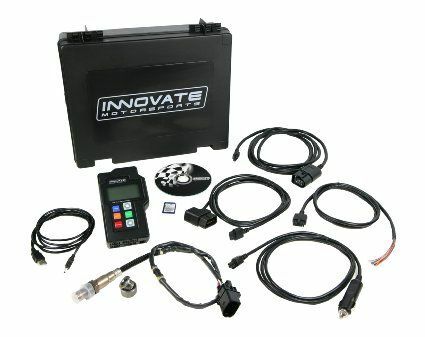 Innovate's new LM-2 combines a wideband controller, an OBD-2 scan tool, and a data logger, all in one handheld package. Like the LM-1 before it, this one monitors the air / fuel ratio with a Bosch LSU 4.2 wideband sensor, and records information to its memory for playback later. Also like the LM-1, it has two programmable analog outputs that you can use to send the information about your air / fuel ratio to an aftermarket ECU like the Megasquirt, or to a gauge or a dyno computer. It also adds the option of a second O2 sensor, although the one on this catalog page is their single sensor model. Innovate gave their data logger a major redesign. They started with an improved and revised version of their "Direct Digital" wideband control circuit for precise measurement. This one compensates for changes in altitude, temperature, and sensor condition. No just trusting the calibration resistor here - you can recalibrate it as the sensor ages. Then Innovate added many new features. They moved the data logging memory to a removable SD card (included with the LM-2) so you can bring along more cards if you need a whole race day's worth of recording. And they added the ability to scan OBD-2 ECUs using either the OBD port or a CAN bus. The LM-2 can log 16 channels of data though the OBD-2, letting you analyze what your stock engine is doing. It can also log data from other Innovate MTS products, allowing 32 channels of data logging in all. Here's the full rundown of features. This package includes the LM-2, wideband sensor, 10 foot sensor cable, cigarette lighter power adapter, SD memory card, carrying case, quick start guide, LogWorks CD, oxygen sensor bung and plug, and all the cables needed to hook it up to your laptop, OBD and CAN ports, and its analog outputs.